A bay window provides a stunning attribute to a home. Victorians and Edwardians made full use of bay windows in their homes, and they continue to be featured on new build homes today. However, many homeowners hide their bay windows behind heavy curtains and drapes. Instead of hiding your bay windows, you should embrace them. Plantation shutters do just that, enhancing your window from the inside and outside while adding value to your home. What plantation shutters will suit my bay windows? Bay windows come in many shapes and sizes. The versatility of plantation shutters allow for a combination of open and closed louvres (split louvre array) and panels (tier on tier) or even panels covering just the bottom part of the window (cafe style). However, tier on tier style plantation shutters remain the most popular option for bay windows as they’re incredibly functional. With the tier on tier style, you can have both tiers closed, while still being able to adjust the slats to allow light to enter the room. When the top tier is opened, the shutters work in a cafe style, allowing maximum light to enter the room while keeping maximum privacy on the lower half. 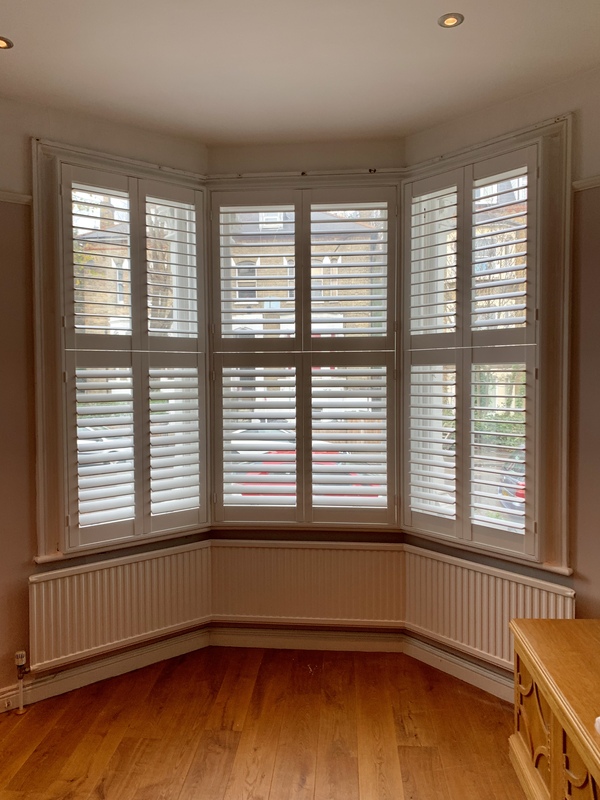 As well as providing great light, privacy and noise control, plantation shutters for bay windows have been proven to be the most energy efficient window covering and will reduce energy bills. Plantation shutters will offer the best option to insulate from the heat and cold that can enter from all sides of a bay window. Whether you have a curved, angled or box bay window, Totally Shutters will be able to design, manufacture and install a plantation shutter solution for you. Call us on 0203 960 6963 for more information on plantation shutters for bay windows or to book your in-house survey. All shutters from Totally Shutters come with a 5-year guarantee.